Q: The new US ambassador to Australia said today China is using "payday loan diplomacy" to exert influence in the Pacific. How do you respond to this? A: Similar questions have been asked a lot recently. Cooperation between China and Pacific countries, in particular Pacific Island countries, is mutually beneficial. Such South-South cooperation that benefits both sides is well received by Pacific countries. We have noted that some US officials keep finding fault with the mutually beneficial cooperation China is conducting with others, including Pacific Island countries. We hope that these people could adjust their mindset, bear in mind the long-term development needs of these developing countries, and contribute to their development instead of constantly making troubles out of nothing. Q: Yesterday President of Venezuela Nicolas Maduro announced that he would ask the United Nations, Russia and China to investigate the cyber attacks against Venezuela's electricity system. Does China have any plan to take part in this investigation and if it is true, when will Chinese specialists go to Venezuela? A: The Chinese side noted that the massive blackout has lasted for several days in Venezuela, causing much inconvenience to the work and life of the Venezuelan people. Reports say that the blackout was caused by cyber attacks on Venezuela's power grid. The Chinese side is concerned over this and hopes that the Venezuelan side will identify the cause and restore normal power supply and social order as soon as possible. The Chinese side stands ready to provide assistance and technical support to the restoration of power in Venezuela. Regarding what you asked about sending specialists, I have nothing to announce at this moment. Q: The US Secretary of State Mike Pompeo criticized China in an international energy conference yesterday for preventing regional countries from accessing more than $2.5 trillion in energy reserves in the South China Sea. Does China have any comment on this? A: China and relevant countries have disputes over maritime delimitation and territorial issues on islands in the South China Sea. China believes that countries concerned need to settle relevant disputes in a fair and reasonable manner through friendly consultation on the basis of international law, and pending a settlement of the issues, countries concerned should shelve differences and explore ways of joint development. China has been in contact with countries concerned via diplomatic consultation mechanisms and internal discussion channels. It serves the interests of regional countries that those countries can manage and handle differences in their own way, and jointly uphold regional peace, stability, development and prosperity. Meanwhile, some non-regional country has repeatedly stirred up troubles in an attempt to ruin the harmony. Such attempts are irresponsible to regional countries. Q: I have a question on the Korean Peninsula situation. We noted that on March 12, some DPRK media carried articles clarifying the DPRK's stance on complete denuclearization. They said that it is the country's firm position to establish a new type of DPRK-US relations, establish a peace mechanism to ensure lasting stability of the peninsula, and achieve complete denuclearization. There are also reports quoting special advisor to the ROK President Moon Chung-In, saying that the US should seek to realize denuclearization of the peninsula step by step, because the "denuclearization at one go" strategy will not help break the impasse over the negotiations. What is your comment? A: China always believes that the Korean Peninsula issue can only be solved peacefully through political dialogues. After the Hanoi summit, as you may have noticed, the DPRK and the US both expressed willingness to continue dialogues. We look forward to seeing concrete actions from the two sides. Regarding the political settlement of the Korean Peninsula issue, experience teaches us that the key to keeping up and advancing dialogue is to accommodate all parties' legitimate concerns in a balanced way, build up mutual trust and consensus, take phased and synchronized steps, and start with easier moves so as to create favorable conditions for a political settlement. China will continue to play its due role along with other parties. Q: We are all closely following the recent Ethiopian Airlines accident. Do you have more information about what has been done for the follow-up matters of the Chinese victims? A: We talked about how the follow-up work was going on here the other day. 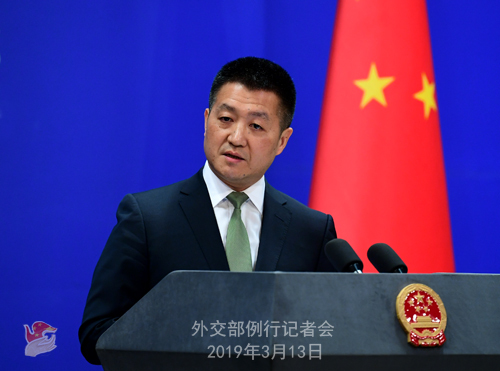 According to what we've learned further, the Chinese Embassy in Ethiopia has contacted the employers and families of the eight Chinese citizens killed and coordinated with the Ethiopian Airlines to arrange for the families' trip to and accommodation in Ethiopia. As far as I know, some of the families have arrived in Ethiopia. The Chinese Embassy in Ethiopia has put in place three special hotlines and set up a liaison office in a hotel near the airport to assist the families. We noted that the Ethiopian side has set up an investigation committee. You may have also learned from the media that the two black boxes from the aircraft have been found and the cause of the accident is still under investigation. 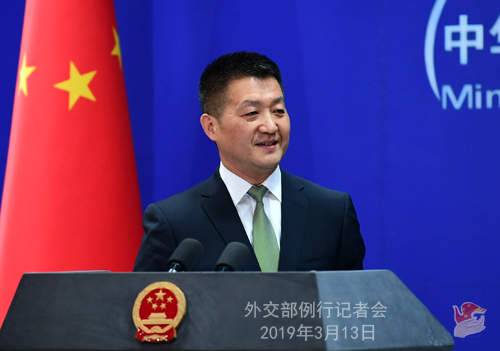 The Chinese Foreign Ministry and the Chinese Embassy in Ethiopia will continue to closely follow relevant progress and coordinate with relevant parties in Ethiopia to provide full assistance to the families of the Chinese citizens in handling the follow-up matters. Q: An international rights activist wrote an op-ed outlining the detention conditions Michael Kovrig and Michael Spavor face. Does China have any comment on the op-ed? A: I remember answering your question yesterday. I want to reiterate that after Chinese state security authorities took compulsory measures against these two Canadian citizens in accordance with law for activities endangering China's national security, the Chinese side has ensured their legal rights and interests in accordance with law. Q: The United Nations Human Rights Council is going to adopt the report for China's Universal Periodic Review (UPR) in Geneva on March 15. Do you have more details? A: On March 15, China will participate in the session of the UN Human Rights Council on the adoption of the review report for China's third UPR. China attaches high importance to the adoption of the report and will send a high-level delegation headed by Vice Foreign Minister Le Yucheng and comprised of representatives from ministries of the central government, the Xinjiang and Tibet Autonomous Regions, and the Hong Kong and Macao Special Administrative Regions. China will give feedback to the recommendations it received in the 3rd UPR in November last year and have constructive exchanges with various parties. Q: The European Commission and EU foreign policy chief published on Tuesday a list of ten actions needed for rebalancing relations with Beijing amid China's growing economic power and political influence in a document called EU-China: A Strategic Outlook. What is your comment? A: The China-EU comprehensive strategic partnership has been developing quite well lately. It serves the common interests of both China and the EU. We have noted this document released by the EU. I'd like to stress that the mutually beneficial cooperation between China and Europe serves the common interests of the two sides. China always views its relationship with the EU from a strategic and long-term perspective. We stand ready to enhance mutual understanding and practical cooperation with Europe. We hope that the European side could view China's development and the new round of reform and opening-up in an objective, reasonable and unbiased way, and work with us to continuously promote the sustained, sound and stable development of China-EU relations. As for the issues specified in the ten actions of the report, I want to say that China and the EU maintain constructive dialogues in all these areas. Q: You said that China is ready to offer assistance and support to Venezuela. Have you already received a formal request from the Venezuelan government asking for such help? Do you have any specific information on what kind of help China would offer to Venezuela? A: China and Venezuela are friendly nations that maintain friendly cooperation across the board. I believe I just made it very clear that China is concerned about the inconvenience to the life of the Venezuelan people caused by the massive blackout in the past several days. The Chinese side is ready to provide assistance to the best of its ability for the restoration of power in Venezuela if the Venezuelan government makes such requests. Q: President Maduro said at a press conference that he has some information that the cyber attack came from Houston and Chicago. What is the credibility that China gives to this assessment by Maduro? A: We have noted relevant reports. Only the parties accused by President Maduro are capable of making a clarification or explanation. Q: Has China decided what it is going to do about the listing of Masood at the UN Security Council? A: I would like to reiterate that the Chinese government will continue to participate in the review work of the Security Council 1267 Committee in a responsible manner. Q: Another question on the EU-China: A Strategic Outlook report. Europe outlines China as a competitor instead of a cooperative relationship in the report. Is China worried about that? A: China seeks to view and deepen its comprehensive strategic partnership with the EU from a long-term and strategic perspective. Of course, we hope that on the basis of mutual respect, a relationship featuring greater wellbeing, mutual benefit and win-win outcomes can be established between our two sides. As for the competition issue you mentioned, some competition may exist between economies and countries, but it should be approached with a correct attitude. Healthy competition, instead of vicious competition, should be encouraged. Otherwise, no party's interests, not those of the Chinese side nor those of the European side, will be served. I still want to emphasize what I said earlier to the RIA Novosti journalist that we hope the European side can view China's development and the new round of reform and opening-up in an objective, reasonable and unbiased way, and see more opportunities from China's further development. Q: Further to what you said on the 1267 Committee. Last time you said about the reports on March 13 to be the deadline for a decision on this by the UNSC members. Is it still the case? Of course at the UN it's still the night of March 12, so it will probably come out next morning. Is China in talks with all the parties concerned regarding this particular issue? A: First I need to make clear that as I recall, in previous press conferences, I have not stated the deadline for the UN Security Council or its subsidiary bodies to discuss this issue. China will continue to uphold a responsible attitude and deal with this issue with relevant parties via thorough consultation. Discussions on this issue must be conducted following the rules and procedures of the UN Security Council and its subsidiary bodies. China believes that only a plan acceptable to all can offer a long-term solution. Q: The US has reinforced blockade against Cuba with Chapter III of the Helms-Burton Act. Can you tell me China's comment on it? A: China holds a clear position on US sanctions and decades of embargo imposed on Cuba. China and most UN members have long been opposing US sanctions that have brought great harm to Cuba's economic and social development and people's lives. We urge the US to correct such wrongdoing. This is the position of China as well as the majority of UN members. 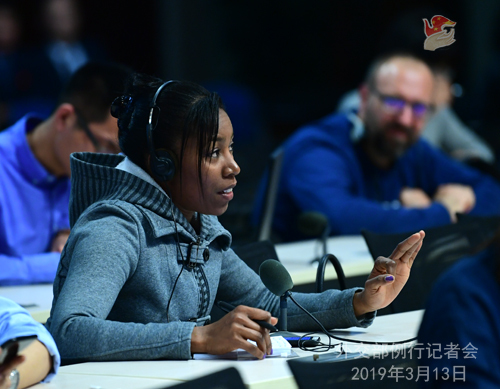 Q: Last week there were some questions about a possible trip by President Xi Jinping to Europe. I wonder if there is any update about the dates, which countries he will be visiting and the activities? A: Please stay patient. When it comes to the Chinese leaders' visits, we always release relevant information in advance. So if the information is confirmed, we will release it in a timely manner.